New Season and a time for a new section: Other coaches feel free to add your drills, games, team play and other coaching ideas. I will start adding the pdf to the postings. Handle the puck all around the body. Have loose shoulders. Triple threat position means you can carry the puck, pass or shoot when the puck in on the forehandl side. Don't over handle the puck. 1.Create a circuit with obstacles. 2. Carry multiple pucks or balls around the obstacles quietly and under control. 3. Handle the puck on the forehand only in the triple threat position. Make many moves and pivots. I did a skill session today with one pro player. The coach could do the same thing with a team but set up a circuit and instead of the coach passing another player could pass. Overload the nervous system with taks for the hands and feet, many objects, skating and balance exercises without then with a puck. Practice redirecting hard passes over the goalie pad and shoot in rebounds. Add give and go passes. Either one player and a coach or a circuit for a team. Place a 14"-31 cm board across the goal line. Player must always try to score. With multiple balls and pucks keep them within a stick length and little noise. 1. Skate edges and puck handling warm up. e. one foot - forward down return backward. 2 . Repeat while moving a puck all around the body.Forward down and return backward. Carry the puck down the ice in a weave pattern using only the forehand and then only the backhand. 4. Carry 4 different kind of balls what are shaped differently, different bounce and weight. After each lap leave one ball and add one puck until 4 pucks.1.Handle 4 different balls in figure 8's. 5. Carry 1 puck only on the forehand and facing the middle. 6. Give and go random pucks-one hard move around a net and score. 10 pucks - keep score. 7.Hard pass and one touch it in with the stick facing the net. Put in rebounds. I have worked with Blair the last 3 off seasons and have seen an improvement in his puck handling. He has a highlight video from last season. He started slowly as he was studying for his CFA (a Yale graduate) and had only trained for about 2 weeks when he got a contract in Finland. Oncehe got into playing shape he had a good second half of the year. He is fit now and deciding on a few contract offers in Europe or whether to try to play in the American League again. http://www.youtube.com/watch?v=3K1NIjeIH8c is his highlight video. It is important that the skate blade is aligned properly so that you can glide straight and not off to one side or the other. The blade is usually in a line from just inside the big toe, but everyone is a little different and a poorly aligned skate can cause problems in the stride. Do a T push and glide along a line on one skate without making corrections to fading one way or the other. If you can glide straight in this relaxed position then the skate blade is in alignment. If not then it should be adjusted. Dr. Gaston Schaeffer (Body Mechanics), Olympic Figure Skating Coach, Swiss skating champion, feature skater for Holiday on Ice and Ice Capades, skating instructor for various hockey clubs in Europe. Gaston talks about creating tension with the stride which transfers into more power and speed with each stride. First Gaston explains the stride and then there is an on ice demonstration. Face the puck, give a target, timing so you don't have to stop. Always follow the shot for a rebound. Shoot to score. 1. F1 pass to D1 and give wall support. 2. D1 pivot to the inside and pass to F1 or F2. 3. F1 or F1-F2 skate to the other side. 4. F1 or F2 regroup pass to D2 and support on wall and middle on 2-0. 5. D2 pivot and pass to F1 or F2. 6. F1 or F1-F2 attack and shoot. 7. Follow the shot for a rebound. - screen or rebound for the next shooter. - challenge next attackers and defend 1-1, 2-1 or 2-2. - attack vs opposite coloured D and D rotate in to fill for defending D.
Players are in one line above the hash marks. X1 dumps the puck into a corner, chases the puck, turns up the boards and bumps the puck back. X2 follows X1 into the corner picks up bump-back and passes to X1, who has skated into the slot. X1 shoots and then goes back in line. X3 shoots a puck into the opposite corner. X2, after passing, skates across into opposite corner, picks up puck shot in by X3, skates up boards and bumps puck back. X3 loops into corner picks up bump-back by X2 and then passes to X2 who has skated into the slot. X2 shoots and goes back in line and X4 dumps in corner. Make sure the bump is done correctly so the puck comes off the boards. Don't make the trailer have to dig the puck out. The shooter should turn and be open to the puck with his stick set to shoot. Players are in 2 lines above the hash marks. X1 dumps the puck into the corner, skates in and picks the puck up. X2 skates behind X1 and acts as a decoy for a low cycle. X1 skates up the boards toward the defenseman D and bumps the puck off the boards. X1 moves to provide a "pick" on the coach "C" who is acting as a defender. D moves around the pick and into the circle where he can either shoot or pass to X2 who has moved into the slot. X1 needs to set a screen for the D without interfering with the defender. D needs to read the play and move quickly down the boards utilizing the screen. Russian Practice: Kevin Sullivan sent me this link of a Russian team practicing. The drills are at high speed. Click on the video at the bottom. It has part of a Russian practice in St. Petersburg. I counted 7 drills in it. Next week the Czech are supposed to print up the practice plan. I will keep an eye on the site for the plan. All simple skill drills on the video. Kevin sent me another link concerning Czech off ice training. Here is sample video of summer youth training (off-ice) in the Czech Republic. Example of Training in clubs in the south Czech region. Video is at the bottom of page (You tube). Bukac Jr. is pushing the off-ice training to get the Czech teams back to where they should be internationally. Re: Balance, agility, puck handling, quickness. Balance, agility, puck handling, quickness. This is another good off ice hockey specific training video from the Czech Republic. Both Canada and the USA have over 500 000 players. In order to compete with us (Czech Republic and Slovakia now combined only have 32 000 players in the communist era they had over 80 000) they must train the players they have better than in NA. A few days ago I posted a Russian practice and they progressed from simple to more complex DRILLS. At the end the D were defending and then making a pass for the new attack after a whistle. There is nothing wrong with the progression except that it leave out the next step which is Transiton Games. A coach can use transition games that create any situation from 1-1 to 5-6. ONE PUCK is used only, as in a REAL game and when they transiton from offense to defense the defender must fight for the puck and make a breakout pass under real pressure and the attackers continue to try and score by winning loose pucks, cycling etc. The coach can create the situation he/she wants by adjusting how many offensive or defensive or offensive and defensive players join the rush. The new players can be passive, waiting for the breakout pass or active and join the play. Some can be passive and some can be active. It all depends what the coach wants to focus on. Adjust how many players are active at one time to have a good w/r ratio. Teach your player how to play under pressure and transiton between the situations Loose puck-offense-defense and quickly change their game playing role from puck carrier to puck support and when they lose the puck from checking the puck carrier to covering away from the puck. That is the game. If we do only drills where the players are told the situation beforehand then how do we expect them to be able to read the situation and how can we develop creative players if we spoon feed them everything and only use Command Style Teaching (the lowest form of teaching on the learning continuum ). We want to create independent learners and we need to get out of the 50's educational model (command style drill and practice) and at least progress to the 60's or 70's in the way we run practice. Move toward developing independent learners by using task cards at stations that say what to work on and a few important points, allow your players to create power play options on their own after you have given them a basic structure. Give them 10 minutes to work on what they think they need to work on while the coaches act as a resource by skating around and helping if they are asked. Let them work as partners and teach each other. So my new theme is "GET OUT OF THE LINES AND INTO THE TIMES"
I spent a year with international and former NHL pro coaches in Austria and I watch a lot of jr, and NHL practices here as well as pre-season camps with pro's. I see transition games about 5% or less of the time. I think practices should be at least 40% transition games. You don't have to be a traffic cop with the whistle but instead can talk to players and give input when they come back to the line up. Coaches can create back checking games, D joining the attack games, teach D zone coverage, forecheck, cycle etc. just by modifying the rules. Add regroups or dump ins to work on puck possession or winning loose pucks. Another benefit is the transition games are so intense that there is NO need for conditioning skates at the end of practice. In the files section there is a pdf with lots of DT coded transition games. There is a transition video section in this site and if you search DT or transition game in the search box you can find many examples. Errka Westerlund did a great little manual and video for Hockey Canada in about 94 and it is a fantastic resource that is seldom used. There is nothing wrong with the progression except that it leave out the next step which is Transition Games. A coach can use transition games that create any situation from 1-1 to 5-6. ONE PUCK is used only, as in a REAL game and when they transition from offense to defense the defender must fight for the puck and make a breakout pass under real pressure and the attackers continue to try and score by winning loose pucks, cycling etc. Teach your player how to play under pressure and transition between the situations Loose puck-offense-defense and quickly change their game playing role from puck carrier to puck support and when they lose the puck from checking the puck carrier to covering away from the puck. I see transition games about 5% or less of the time. I think practices should be at least 40% transition games. On holidays in Bend Oregon until after Labour Day, but felt I had to comment on the gist of Tom's words (which I have taken liberties to shorten into what I consider the key points). I agree 100% that the missing ingredient in today's coaching is "transition games". The Colombian and I call them "smart transitional games" because we design the end result of these games such that they reflect objective measures (keep score: winners are rewarded, losers owe us extra fitness / skills practice to get better for next time). This increases intensity and competition... and over time, it is positively reflected in the performance of your individual players and team outcomes! This is 21st or 22nd century coaching! Get with it people!! "Great education depends on great teaching." I modified a 2/3 ice transition game where the coaches regroup with the new attackers to the players passing and then follow to support the defenders from the top of the circles. I wanted to teach the hinge, so we did a drill for the teaching the hinge to everyone first and then we did this transition game. It is a good game when you only have one goalie at the practice. New players give defenders support from the top of the circles as if they were wingers. If the puck is carried above there they can. 1. Red 1-2 attack Blue 1-2. 3. Pass to Blue 3-4 after a turnover or goal. 4. Blue 3-4 breakout the other direction. 6. Blue 3-4 regroup with Red 3-4. 7. Red 3-4 hinge at least once. 8. Red 3-4 pass to Blue 3-4. 9. Blue 3-4 attack vs Red 1-2. 10. Red 3-4 follow attack to support Red 1-2. 11. Blue 5-6 move to nzone ready to regroup with Red 3-4. Continue this rotation of support-regroup-hinge-attack-defend. The purpose of this one goal transition game is to create various situations that the defenders must recongnize and communicate with each other. The attackers must also read how many defenders and adjust their attack. Once the coach tells the next group how many attackers go they can spread out across the blueline to give better support. You really could do this up to 6-5 if you have a lot of players but with one team up to 3 is good. The defenders have to recognize the new situation and communicate 3 on 1 or 2 on 2 etc. Vary situations from 1-1, 1-2, 2-1, 1-3, 2-3, 3-3, 3-2, 3-1. 1. Play a game situation from 1-1 to 3-3 and all variations. The coach tells the defending team who are waiting at the blueline whether 1 2 or 3 players attack next vs the attackers who must defend when they lose the puck. 2. One puck only is used. 3. Sequence is attack-defend-pass to team mates waiting at the blue line-rest. My son posted this video on Facebook. Fantastic examples of how to play the game when the puck is on your stick. It is an Alex Tanguay highlight video. He holds the puck on his forehand in the triple threat positon and this sets up his fakes, moves and passes both ways. 2. Making the pass early. 3. Following the pass for a give and go. 4. 4th player joining the attack. 5. The player who crosses the blue line with the puck seldom score. 6. Quick looks to find open players. 8. Shooting where the goalie came from and not where he is going. 9. Getting open and keeping the stick free. 10. Fake shot to freeze the defender. This is a very aggressive forecheck that we are using. It takes away time and space and requires fitness, good skating, creating angles, reading the play, stick on the puck and body on body, sticks in the passing lanes and an aggressive attitude. It is very hard to play against. The philosophy is that most players need about 2" to make a play, good players need about 1" and only the top players can make plays in the .5" we want to give them. This is basically man to man aggressive coverage. Players must create good checking angles, force inside to outside, stick on the puck and body on body. On the wide pinch the original strong side D must support the pinching D and 3 fill. 1. F1 on the puck. 2. F2 on the other D.
3. F3 cover F on wall. 4. D1 cover the weak side forward. 5. D2 lock on player in the middle. When puck goes to weak side. When the middle D pinches or presses on the weak side wing they stay low in the zone and are part of the cycle, while the original strong side D has moved across to support the new strong side and the original F3 is now on the weak side point. If the puck rotates to the other side the original F3 (now covering the mid point) will pinch while the strong side D shifts over and whoever is #3 on the forecheck fills the mid point. F3 stays there until the play is finished and looks for back door opportunities. If the puck rotates back to the original side then the original F3 who is covering the mid point pressures the wing on the original side and the original strong side D slides across to support that pinch or press and whoever is 3 on the forecheck covers the mid point. So you end up with a D taking the attack on the strong side. So the important point is that there is no pinch on the strong side (puck side) but that D takes the player coming through the middle and #3 takes the pass to the puck side boards away. This forecheck allows the D to be a much bigger part of the offense and demands that all players learn how to play a defensive 1-1 to 3-3 starting from the point. I would like to hear some comments from other coaches. 2-F2 pressure D pursue puck denying regroup touch back to D.
3-F3 fill original strong side point. 4-D1 pinch on wide wing. 5-slide across and fill behind D1. So on a wide rim #4 the middle D pinch down hard and #5 the strong side D come across and fill behind the pinch while #3 who was just covering the strong side wing slide back and cover the middle point. On a D to D to weak side Wing #4 (middle D) close the gap quickly and pressure the weak side wing. Stay in on the cycle if there is a turnover. PRESSURE-PRESSURE-PRESSURE "That is why we call it the TSUNAMI FORECHECK." The goal of this forecheck is to create both physical and psychological pressure on the defenders. Giveaways in the defensive zone create scoring chances about 25% of the time. If the puck is moved across to the original side then F3 who covered the middle point now pressures the weak side boards. "THERE IS NO ESCAPE FROM THE TSUNAMI." 1 - Original F3 who covered the middle point now pressure the weak side winger. 2 - Original D2 slide across to support original F3. 3 - #3 in the forecheck cover the middle point. 4 - #2 back pressure the puck denying a pass back to the offensive D.
5 - #1 come back hard through the middle and become the new #3. If they make a successful breakout then #1 keep coming back hard and give back pressure to the puck carrier all the way into the defensive zone. If they are successful entering the zone then the back pressuring forward stay deep with the D and play the low 3-3 while the other two back checkers cover the points. First the middle point and the last back checker cover the strong side point. This is a video using a 3 dimensional magnetic rink to explain defensive zone coverage. I have attached two terrific pdf's that do an exceptional job of explaining how to play in your end. One was posted on the site but I can't remember who did it but it goes through the various rotations. He uses D-W-C which are home positions. The other is by Perry Pearn who I used to coach against in college and now has been an NHL asst for a long time. Now with Montreal. He uses the terms D1, F2 etc. It is from a presentation he did at a coaching seminar. This is a link to the hockeycoach.com site posting of this topic. For some reason now when I copy and paste the posting only appears when you are logged in. There is a discussion about the pk vs the slot set and overload which have two players at the point and then two videos. The first is Detroit practicing the pp and pk and the second is a European pro team practicing being aggressive on the pk. This is a sheet that has principles for penalty killing that we used in Austria. I don't agree with the one principle of finishing the checks on the pk. It takes you out of the play. It means more to get there quickly with the stick on the puck and not body check unless the puck is loose and the defender can battle for it. I also have scanned a picture of the coaching staff. The mandate there is to have coaches from every major hockey nation. Not pictured is a Slovakian asst. coach Stanislav Medric and Austrian coach Gerri Wimmer who was my assistant. We all had equipment managers and there was a separate staff for off ice training and another coach in charge of the skating treadmill. I was looking for a few of the drills we did at U of C and I remembered the ebook that Mike Hartman put together. It has a lot of good material. It starts with articles on coaching principles and then has a few hundred drills and finishes with 45 well layed out off ice workouts that include pictures that make the exercises easy to understand. It was posted a long time ago but well worth a look. 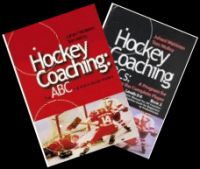 http://hockeycoachingabcs.com/filemgmt_data/hockeycoachcom_ebook_634%5B1%5D.pdf is a link to the hockey ebook. It is in this sites file section but I had forgotten about it. It was done when Mike Hartman took over the http://hockeycoach.com site. I really like how the drills section is layed out on the site and so far I have posted about 270. I do them here and then transfer them there. This drill was shown me by John Perrella who is the teacher in charge in the hockey skills group. I had a big decision this week and turned down an offer to be Head Coach of an emerging hockey nations national team. I put them in contact with a Finnish agent I have done some things with and it looks like they will hire a very experienced and successful Finnish coach for a year. The person who offered me the position is going to come to Calgary for mentoring and intends to bring me overseas in the spring. Don't overhandle the puck and carry it in the triple threat position, follow the shot, rebound for the next shooter. players peel off toward the corner after shooting. Players can all be in one corner or in both. A - Carry the puck and shoot. B - Follow the shot for a rebound. C - Circle back and rebound for the next shooter. A - Skate and get a pass from the opposite corner. B - Accelerate and shoot while moving. C - Follow the shot for a rebound. D - Rebound for the next shooter. This is a pdf of the activities that the players did at the skills camp I ran in the Czech Republic. Quick transition from offense one way to offense the other way. Defensive players must identify who they cover. Communication is very important. 1. Cross ice game with the waiting players along the blue line. 2. Play situations from 1-1 to 5-5. 3. Scoring team get the puck and attack the opposite net. 4. Defending team leave the ice. 5. Next defending players must touch the boards behind their net and then defend. 6. If no goal is scored then the coach blows the whistle after about 30" and the team in possession of the puck pass to waiting teammates who attack while the new defenders touch the boards behind their net and close the gap to defend. *Identify which player defends the puck carrier and then cover the other attackers. Note the heading on the diagram should read King's Score Game. -Push the puck on the flat sections. -Control and protect the puck on turns. -Groups of 3-4 players leave on the whistle and skate with the puck 1.5 laps. -An extra half lap can be added and finish at the opposite end. -Repeat 4 times, 2 forward and 2 backward. -Both groups or only one group at a time can leave. Shield the puck with your body. Protect the puck before checking another player. - Faceoff circles are the battle zones. - 5 or 6 players at each faceoff circle. - 3 or 4 players handle a puck inside the circle while 2 or 3 wait outside the circle. - Protect the puck and also knock the other players puck out of the circle. - When eliminated rotate to the next clockwise circle to change opponents. - Waiting player enter the circle when someone is eliminated. - Put a time limit on the exercise. -Those who move the fewest times are the winners. I like rotating circles when you get knocked out and keeping score by the fewest number of rotations - Thanks Tom! It is pretty hard to keep track of it any other way as there are at least 3 circles going at once. We had the goalies working on skills at the other end and did a lot of things using the circles for skill warm up. 1. All around the circle and pass one puck but eye contact first. 2. Pass one puck but fake a pass to someone first. 3. One puck pass and follow the pass and replace the player you passed to. 4. Two pucks at once with eye contact. 5. Two pucks at once with eye contact and deception. 6. Two pucks at once and follow the pass. 7. Keepaway with 3 or 4 in the circle trying to knock the other players puck out. Rotate in when someon is eliminated and rotate clockwise when eliminated. There is potential to pass while skating around the circle, to have players be monkeys in the middle etc.. The key is lots of touches. Players must challenge themselves out of their comfort zone. Make as many moves as possible and continue until they have shot and looked for a rebound. Take the pass and shoot right away without over handling. 1. Line up along boards on one side. 2. Players 1 and 2 start on the goal line. 3. Players 3 and 4 leave and make moves at top speed. 4. Coach whistle every 7" and they players attack the net. 5.Closest attacker give and go with 1 or 2. 6. Second closest do a tight turn then give and go with 1 o 2. 7. With only one goalie go one way only. 8. After passing return to the back of the line. All times are GMT. The time is now 12:18PM.